Manohar Parrikar, 63, died on March 17 after a prolonged battle with a pancreatic ailment. Former Goa chief minister Manohar Parrikar's sons released a statement Saturday hinting they could enter politics to "continue the legacy" of their father's "dedication to the state and the nation". 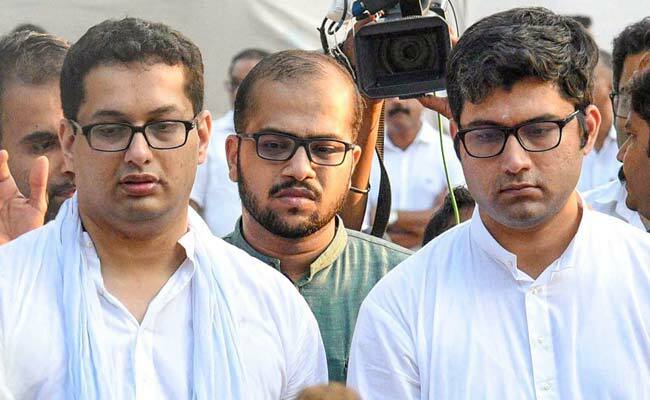 Speculation has been rife in the coastal state since then that Manohar Parrikar's sons -- Utpal and Abhijat -- might take the political plunge in the Lok Sabha polls or the Panaji bypoll necessitated by the death of their father. "My father lived everyday with vigour, a strong will and desire to serve the nation and the state. Till the very last, he was occupied with issues concerning the state," the statement said praising Manohar Parrikar. The statement lamented that Manohar Parrikar's death had "snatched" the "central part" of their family and left a huge void. It also thanked Prime Minister Narendra Modi for his unstinting support during Manohar Parrikar's illness. Utpal Parrikar and Abhijat Parrikar also thanked the armed forces for the military funeral their father received at Miramar Beach on March 18. Earlier, on Friday, Utpal Parrikar said he would take a decision, on entering politics, at the right time.